Dollar Energy Fund is a 501(c)(3) organization whose mission is to improve the quality of life for households experiencing hardships by providing utility assistance and other services that lead to self-sufficiency. For more than 36 years, we’ve served the limited-income community by providing $152 million in utility assistance grants to more than 550,000 limited-income families and individuals. Founded in 1983 in Western Pennsylvania by a coalition of concerned community and business leaders, Dollar Energy Fund, Inc. has grown to become the largest hardship fund in Pennsylvania and one of the largest in the country. The organization expanded beyond Pennsylvania in 2008 with the addition of a Hardship Program in West Virginia. Since then, we’ve extended our reach into Ohio, Virginia, Tennessee and Maryland in 2009; Texas and Louisiana in 2011; Arkansas in 2013; California and Kentucky in 2014, and most recently, Connecticut in 2016. We currently administer Hardship Programs for more than 40 utility companies. Dollar Energy Fund partners with over 450 community-based organizations throughout our service territory. These organizations handle application intake for our programs while also connecting those in need with other forms of assistance. The demand for assistance from our program has grown significantly due to increased costs of everyday living expenses and severe weather conditions. To meet the need, we rely on the generosity of individual donors. Our unique funding model provides a dollar-for-dollar match from our partnering utility companies for every donation we receive. The utility companies also make a separate donation to cover our administrative fees, so 100 percent of all individual donations are used to provide utility assistance grants to limited-income households. Dollar Energy Fund is a 4-Star Charity! 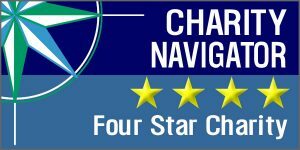 Dollar Energy Fund is rated as a 4-Star charity by Charity Navigator, the nation’s largest and most-utilized evaluator of charities.